For those of you that watch Made in Chelsea, or follow A Fashion Forte, you'll be well versed in the world of Rosie Fortescue. This stylish beauty has recently been on my home turf, roaming the streets of New York in search of all things worthy of her attention. One look at her style or one night in with the telly and you'll know she's no easy lady to please. Hey, she has good taste. Can you blame her for being picky? When I found out Rosie was headed to The Big Apple for an extended period of time I asked her if she'd report back and give FFG readers a short and sweet list on where to go while in New York City. I wanted to know what was happening "right now." She's officially got Chelsea in London sussed so I thought I'd throw her a challenge. She came back with a comprehensive guide and a list of places I myself wouldn't even be able to put together. Rosie, you've outdone yourself once again. 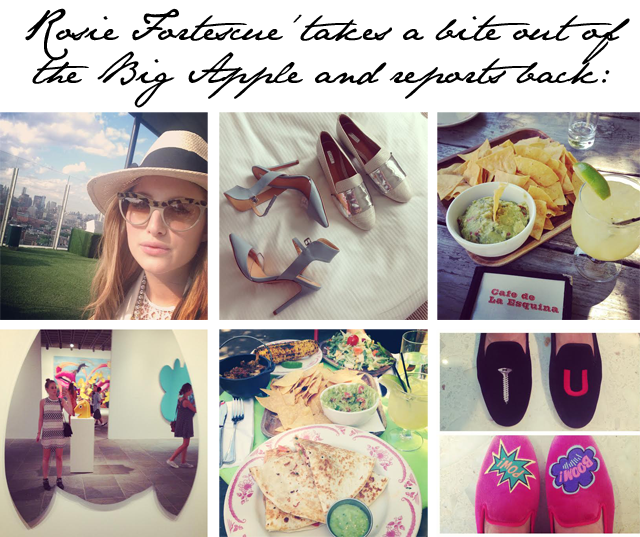 Here's a look at Rosie Fortescue's Guide to NYC from bars to shopping. It's all here and ready to be utilized to its maximum potential. She's kept it to the bare minimum in description... leaving you to discover the beauty of each place for yourself. Trust me, if Rosie's recommending, it's worth visiting. Roof terrace of the Boom Boom Room (848 Washington Street) is super nice in the evenings and not as hectic as Le Bain below. Great to watch the sunset. Up and Down (244 West 14th Street) is probably one of the only proper clubs that I went to and has a great vibe. Jimmys Rooftop at the James Hotel (27 Grand Street) – amazing views over the city. Perla (24 Minetta Lane) is a fantastic date spot. Catbird (219 Bedford Avenue, Brooklyn) – a jewellery lover’s heaven! Schutz (655 Madison Avenue) – has to be one of my favourite shoe shops in New York for flats and heels. Brooklyn Market goes along the river. Definitely worth checking out to stumble upon amazing jewellery. Get thee to the Big Apple, people. Entertainment is waiting on every corner. I mean that in the most polite sense of course. Thanks, Rosie, for all the great suggestions! Make sure to check out Rosie's fashion blog, A Fashion Forte, to see what Rosie wore while in New York.